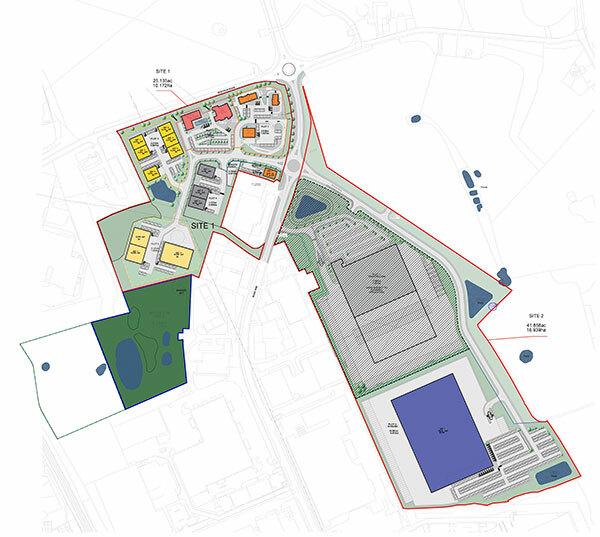 The regeneration of Winsford as a place to live and work took another step forward with plans to expand the employment opportunities at the town’s Industrial Estate off Road One. Up to 1,500 jobs could be created at the site after the Council’s partnership with Public Sector Plc, entitled ‘PSP CWaC LLP’, submitted a planning application to deliver a further 350,000 sq ft of new employment floorspace on land next to the existing site. The Council, Public Sector Plc and Cheshire and Warrington Local Enterprise Partnership have been working in partnership over the past 12 months to develop this important and strategic employment site. The five year scheme will boost economic growth and help the town to prosper. A dedicated project team has been put together to deliver this project, including officers from the Council, PSP CWaC LLP, and National Architects Corstorphine + Wright. The scheme is set to greatly enhance the site and improve the facilities on offer for the people who work there. There are also plans to build complementary uses including a petrol station, a pub and a hotel. Cllr Brian Clarke, Cabinet Member for Economic Development and Infrastructure, said: “In November 2005, Winsford was the first industrial estate in the UK to become a Business Improvement District. It is an important location for employment activity and its significance extends beyond the local area. “Some 4,000 people are employed on the Estate in a wide variety of businesses in a range of different properties. Despite its size and role, it currently offers only limited services for users and visitors with no cafes, restaurants or hotel accommodation. Vital public funding assistance has been secured in the form of £3.8m Local growth funding from the LEP, matched by £1.2m from Cheshire West and Chester Council to help unlock the site by investing in new road access and services. The scheme has been designed thoughtfully and attractively after a careful analysis to enhance the site’s existing features. The creation of a high quality employment area which compliments and enhances the existing setting. Flexible plots and spaces to adapt to market needs. Improved access for vehicles and pedestrians. Easy and accessible layout for visitors which reflects the mix of businesses.